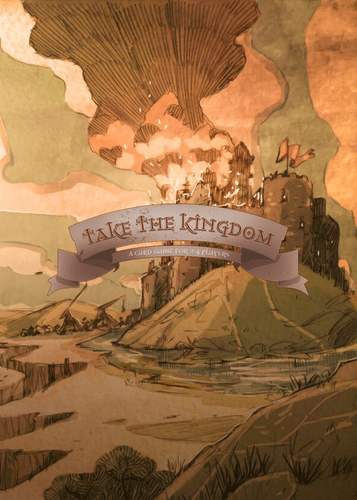 Take the Kingdom* is a 2-4 player filler card game that takes about 30 minutes to play. It had a limited self-published release in 2017 but is currently going through a small overhaul to iron out some production issues with the first version. For me, it feels like it should be pitched squarely at the family market. Children as young as six will be able to grasp the game very quickly, and its length isn’t prohibitive to this age group – in fact, they’ll be able to learn more as they play. Thematically, you each control a medieval kingdom and are trying to finish the game with the strongest lands, or defeat your opponents before the deck of cards runs out – whichever comes first. Be under no illusions – this is very much a take-that game, with as many attacking cards as there are defensive ones. The game’s Kickstarter campaign is now live and runs until September 21, with a copy of the game available there for £19. You can also keep an eye on its Board Game Geek page for updates. Each player starts with several cards on the table: a fort and several land cards, representing their kingdom. You’ll also have a couple of random cards in hand, drawn from the main deck of cards. On a turn, a player draws three cards into their hand (hand limit of six) and then plays up to three cards. Cards come in three flavours – defence, attack and action. Defence cards are mainly added to your lands to add strength to them (they’ll have a number from 1 to 5), while attack cards are played on your opponents’ lands to destroy those defences. Action cards do all kinds of things: everything from stealing opponents’ lands to blocking incoming attacks to taking an extra turn. You have to destroy a land’s defences before you can destroy the land – and once all of a player’s land is gone, you can attack their fort’s defences before you destroy the fort. Once a player loses their fort, they’re out of the game. If the deck of cards runs out while more than one player remains, those left count the points on their remaining defensive cards – highest score wins. The father: A small box, light game with a sub one-hour play time will always get play time in our household. The game is easy to teach and quick to learn; while playing with two players limits some of the issues when playing a take-that style game with younger children. The theme and art capture the imagination and provide the hook needed to engage younger players. However, the game’s footprint can be surprisingly large; depending on the cards you draw it can expand rapidly. The son (aged 6): This game is really interesting, having recently learned about different types of castles at school. The numbers on the cards are clear and the rules are easy to understand. Having two rounds to only play defence cards means you don’t find yourself immediately under attack. The more complicated elements [fortune and mercy cards] are not too difficult to understand and use in play. However, some of the more text heavy cards are still too much at this point; particularly the action cards which can counteract certain attacks. A wider use of iconography would have made this easier to understand. The thinker: There isn’t much here for the more advanced gamer. Too much of the game is on rails, with there being a fair chance you’ll have no meaningful decisions to make on some of your turns. There’s also too much luck, with some cards simply being better than others: if you happen to draw the couple of +5 cards you’ve got a clear advantage on the other players. And connected to this, once you know the deck, the strategy becomes one-dimensional: save your own big cards and wait for the other big cards and deal with them, or bash whoever got the lucky draws. Not for me. The dabbler: As a light filler game, this works. Everyone is quickly up to speed on the rules and the play is relatively quick, even with the most AP prone players at the table. Uncharacteristically for a take-that style game the attacking was fairly balanced, with people preferring to attack the player in the strongest position as opposed to eliminating players. The end game dragged slightly as players withheld cards on the off chance they could be used to repel attacks or gain last minute points. But a good starter game for an evening or ‘between games’ game. For me, Take the Kingdom is a light family or children’s game. For these games to work they need to be as simple as possible and give their players as much help as they can. This is a simple game, but it can do a little more in the help department. There is currently an awful lot of text on the cards – almost all of which could be replaced with icons. As an example, “Used against structural defences. Remove all Hills, Walls, Moats and Battlements from a single Land or Fort card.” Half that text could be replaced with one icon. Similarly, every attack card says “cause 1 point of damage to an enemy fort, land or defence”. This is 100% superfluous and will simply put off the many players who don’t like ‘cards with words’ games. Making the cards simple is key to making this game appeal to its core audience. Another concern when dealing with younger gamers is the way take-that elements work. Take the Kingdom very much allows for players to choose a target and pick on them mercilessly until they are defeated (which they will be). Some people will find this hilarious, some won’t do it all, but you really need to know your fellow players: played meanly, there really is nowhere to hide here, despite the opening few rounds allowing you to build up your defences (if you draw any – but that’s another point entirely…). My final concern is outlying cards, and luck of the draw. Take the Kingdom’s strength lies in its simplicity, but you need to gauge your audience. An example is the game’s three penalty cards. The player who draws one cannot play a certain type of card that round (action, attack or defence, depending on the penalty). If one player draws all three, they’ll feel unfairly unlucky (and rightly so): and certain people don’t deal with that well. Another game would have said that, when one of these is drawn, it affects all players for that round for fairness. This is not one of those games. While the designer ensures me gamers have loved Take the Kingdom, that certainly wasn’t the case with my friends – or with me. While we liked its simplicity and stripped back nature, and everything clicks nicely in design terms, there aren’t many choices – and some cards (all randomly drawn) are too much better than others. However, having given it to a friend (who helped out with chunks of this review – thanks Chris Fenton and family!) with a largely non-gaming wife and enthusiastic gamer son, it was nice to see it appreciated by a younger and less gamery audience. But even then, the text came back to haunt it. As sis understandable with smaller publishers, it seems the game hasn’t been tested with enough people who are part of the industry. 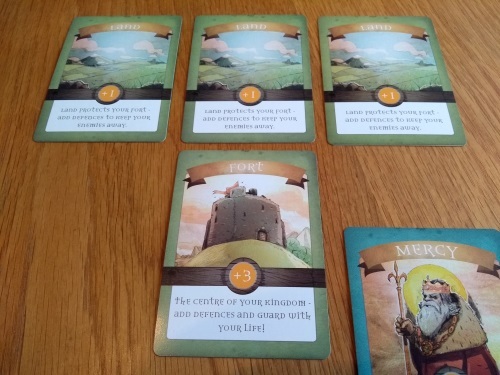 I’d recommend Take the Kingdom for families setting out on their journey into ‘proper’ games; and that would turn into a strong recommendation if the publisher sorts out the problem of having way too much text on cards that could easily be replaced with icons. * I would like to thank Walnut Games for providing a copy of the game for review.